I read the Chronicles of Narnia books when I was a young girl, as all children must at some point. They’re classics for a reason–partly because they’re written by C.S. FREAKING LEWIS. (Oh my gosh, chill, Natalie.) I read the popular ones first–the Lion, the Witch, and the Wardrobe, etc. But I always skipped the lesser known ones, not because I thought I wouldn’t like them, but because they didn’t have movies. (Scandalous, I know.) As I grew up, though, I realized it was time for me to read all the Narnia books because that’s what you do when you grow up. 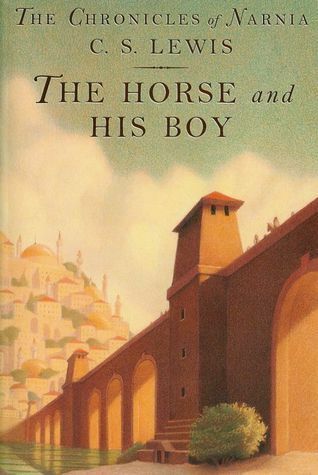 So, I first read the Horse and His Boy when I was fifteen years old. And I loved it. I LOVE THE HORSE AND HIS BOY. I don’t even really know why I love it so. It’s quite different from the rest of the Narnia books, taking place in a neighboring country of Calormen. And while there are a lot (repeat: a lot) of problematic things with this novel, I just really love the characters and the relationships between them. Bree and Shasta, in particular, have a really darling and fun relationship. They grow and learn together so much on their journey to Narnia. And Aravis, too, is one of the most interesting female characters that Lewis writes in the entire Narnia series. She’s spunky and brave, which I admire so much in female characters (mostly because I’m not). All the main characters are a real strength to this novel, and I just love watching them interact. And, as always, I just love C.S. Lewis’s writing style. He always manages to cut right to my very heart. I do not dare not to dare. Say what you will about this novel, but I do love it, irrationally and entirely.